Wandering around my local Target recently I stumbled into the toy section and was admiring the Thor toy section. Action figures, helmets and hammers sprinkled the aisle. And so it signaled to thee the first superhero movie of the summer was upon us. Thor is the most recent big-budget superhero adaptation from Marvel Studios and Paramount Pictures. 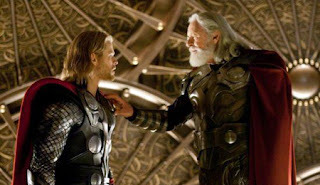 With a budget of 150 million, the film is the first live-action adaptation of Marvel’s Hammer wielding God and is another piece of the puzzle to the long awaited Avengers film scheduled for 2012. The film stars Natalie Portman, Tom Hiddleston, Anthony Hopkins, Rene Russo, Stellen Skarsgard and Chris Hemsworth as Thor. When things get a bit too intense in the mystical Asgard, the arrogant warrior Thor is cast down to Earth, where he finds some satisfaction helping these mortals out. Kenneth Branagh directs, which at first seems like an odd choice for a seemingly silly superhero movie, but the story about a royal family with betrayal getting thrown around seems like an ideal one for a Shakespearan spin and could be the perfect makings for a nice action drama. As of now I’ve heard some pretty positive things coming from this movie. I take internet gossip with a grain of thought though. I’m always suspicious it just might be studio plants trying to pump up excitement for a stinker of a movie. So I’ll reserve my judgment until I finally see the film myself.